My marketing column in the March/April issue of Law Practice focuses on the many ways that charitable involvement–be it time or money–can also pay significant dividends for a law firm’s marketing efforts. Too often it is not fully embraced (or simply ignored) as a tie-in to everything from image branding to professional development. If you have a law firm marketer, is s/he aware of and involved in charitable contributions? Is this discussed by the marketing partner and marketing committee? There are so many ancillary benefits that come from “doing good” that unwittingly get overlooked. Is there an internal list that shows charitable involvement–financial contributions, pro bono, board appointments, events, relevancy to clients? “Giving back” is a hallmark of law firm involvement in a community. Being recognized for those efforts is far greater “branding” than a promotional advertisement or marketing campaign. Read the article to see if your law practice is making the most of your philanthropic endeavors. 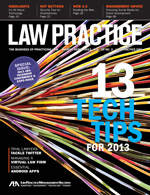 Tagged: "Charitable and Community Involvement", "Law Practice Magazine" and "Professional Development"